What is a horology blog if we do not report or review everything horology related. 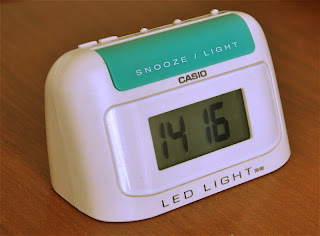 This is my small review of the Casio DQ-582 Alarm clock. This clock is very old. The current version is the DQ-582D. The difference is the the DQ-582D has a blue metallic body with a grey snooze/ light button. 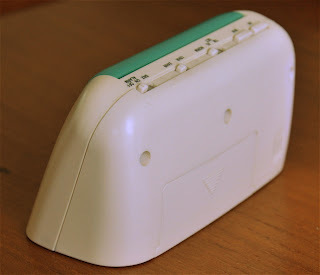 The older DQ-582 is white with a green snooze/ light button. I have had this clock for some years now. I did not buy it. It was given to me. The clock is very small, the base being just 50 X 100 mm, height 50 mm. It is very light and is powered by 2 AAA/ R03/ UM4 batteries. These batteries are available everywhere. The battery hatch is at the lower back of the clock case back. The watch is made of plastic and the fit and finish of the clock is good. The clock is made in China. 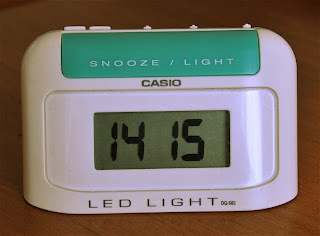 The clock has a back light and it is a small green LED located on the left of the LCD. Although the coverage of the light is not even as EL back light, it is bright enough. The light button also acts as the snooze button. The LCD is 20 mm in height and the digits are big. Visibility is good. The clock has a daily alarm and a snooze function. The alarm is loud. 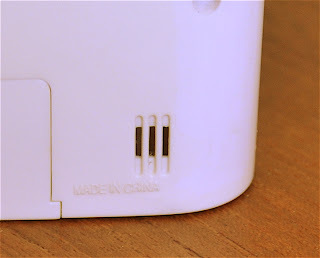 The alarm speaker is located at the back of the clock. The holes for the alarm is small compared to the size of the speaker. The snooze function is cool and it repeats every 8 minutes when the snooze button is selected. The control for the clock is at the top. Adjustment is very easy and the buttons are well labeled. The buttons from left to right, HR for hour adjustment of the time and alarm, MIN for minutes adjustment of the time and alarm. The adjustment is one way, so if you over shoot the time, it is one full circle to get back to the correct time. Next is the time and alarm set selector. Position the selector to TM (Time) and you can adjust the time. 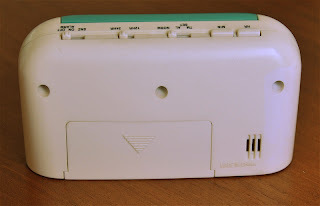 AL (alarm) for alarm adjustment and NORM for the normal time display. Then we have the 12/ 24 hour selector, 12 HR and 24 HR. Next is the alarm selection. Position the selector to SNZ and you activate the alarm and snooze function. ON is for alarm on but no snooze. The alarm will sound for 1 minute. OFF, well alarm off. I like this clock and it has traveled with me to many countries. It has been replace by the Casio GQ-500 G-Shock alarm clock, but I still bring this clock for my travels. i have this clock and it is very nice . everything is described very well. Welcome to the blog. Thank you for the kind words. You have an interesting site. All the best. Where could i buy one? All i find are the new ones and my mother had this exact one but it sadly broke after many years (since she was a teen) and it would make for a nice surprise to get an exact one and not one of those new blue ones. If anyone could link to me where i could buy one thag would be fantastic!